Although the 1980s was the decade fashion and taste largely forgot, it’s not one that slots developers have quickly discarded. 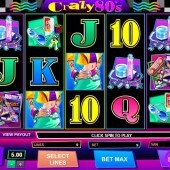 And with the 80s enjoying a revival of sorts through music and fashion that are around these days, it's fitting that online casino slot game developer Microgaming have got in on the act with their own retro-themed slot. 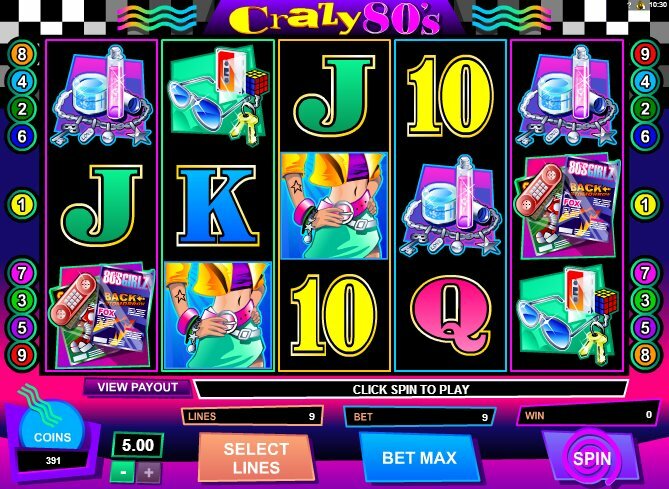 Following in the footsteps of NetEnt's own take on the decade of Live Aid, Madonna and terrible haircuts, The Super Eighties, Microgaming's Crazy 80s treads similar ground and if you’re an Eighties nut, however, you’ll probably be drawn in by the bright colors and overall pop tone. In terms of imagery Crazy 80s is very similar to Net Ent's effort: the Sony Walkmans and neon of The Super Eighties have given way to legwarmers, mix tapes and Rubix cubes here, and a nice little magazine icon featuring the classic 1985 movie, Back to the Future. Elsewhere there's a girl in Day-Glo pants, make-up, and the familiar 10-through-Ace poker symbols. To top it off, there's even a cheesy 80s ditty playing in the background to put you right in the mood. This is one of Microgaming's slots that starts at $0.25 a coin, so it is on the expensive side for penny-bet slotsters, but with just 9 pay-lines you won't have to fork out too much to play all the lines. Saying that, with just the 9 pay-lines you may be waiting a while for a decent win. Look out for the stereo icon, as it acts as the game's Wild. It substitutes for all regular symbols other than the Scatter, here the girl's leg warmer-clad pins. A 50-coin jackpot - if you can call it that - is awarded for five Scatters across the reels anywhere, but unfortunately there's no bonus round to trigger. It's a shame, as Microgaming are pretty good generally on the bonus features. The theme of the 1980s lends itself perfectly to some pop fun, and even a retro-themed Pick 'Em Bonus would have been something. As it is, nine pay-lines and a generous jackpot of $225,000 at the maximum stake of $5 a coin are the main draw here. For me, I'll be back off to NetEnt's retro '80s slot, plus their great 1970s retro slot, The Funky Seventies, for some proper retro entertainment.